I did it. I completed the 2008 RPM Challenge. I created an entire album in one month. 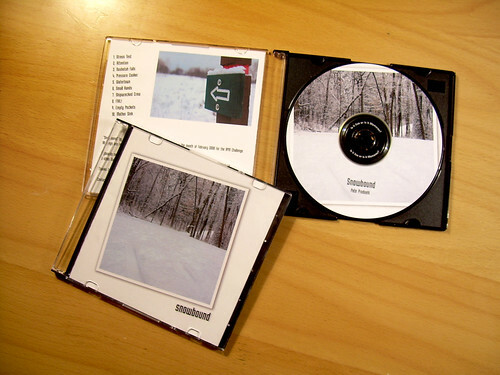 10 songs, written, recorded, and released in February 2008. And I had fun doing it! But it wasn’t all fun. It was hard at times, and there was frustration, and while I always knew I could easily record 10 songs, I wasn’t entirely sure the quality would be where I wanted it. First, the frustration. I use a USB adapter to plug my guitar and bass into my Mac. GarageBand recognizes it. Usually. In the first or second day into the process, GarageBand went nuts and stopped working. I spent like 3 hours fixing it, including a re-install, and creating a new user and copying files between accounts. Eventually it all worked, but through the month GarageBand dumped on me a few other times in various ways. It’s frustrating when your equipment won’t even work right. Then there was the creative frustration. Last year when I started recording on my own, I would just plug in the guitar when I felt like it and bang something out. For this album, there was the pressure of must record a song on an almost daily basis. Luckily since I only needed 10 songs in 29 days, I didn’t have to record every single day, I skipped some, like the day I worked for 14 hours, or the Sunday I did a video shoot on location for 12 hours. Yeah, it was a busy month. Typically it would take me about 3 hours to do a song. When I say “3 hours” that is me sitting down with the instruments, playing a bit, recording, and then assembling the song. I didn’t write anything ahead of time, it was all done as I was recording. I don’t know how many people do it this way, but it worked for me. In the future I’d like to spend a lot more time on songs. Mainly because I think I can make them better. So even though I had 29 days to do this, I probably spent less than 30 hours total actually recording music. Speaking of quality… am I happy with the quality of the album? Yes and no. There are some songs I actually really like. But then, there are bits and pieces I know I could have done much better, and some songs I really don’t like at all now. I think spending more than a few hours in the evening on a song would be worthwhile to get a better perspective on it. I followed the same workflow I usually do with songs, once I record them and mix them (and yeah, I need to improve my audio engineering skills) I bounce to an MP3 and upload it right away. This is good because I get it out there immediately, but bad because I should spend more time tweaking the little things until is it just right. Release Early isn’t always the best idea. Also, I put everything up on Ourmedia and the Internet Archive right away, which again, is good and bad. SpinXpress totally broke for me at one point and I could not upload anything. I then started putting everything on blip.tv as well for good measure. Next time I might wait until I am actually happy with a song before I upload to a permanent place the the archive. Even the whole packaging and cover art, I liked, but was not 100% pleased with. I had other ideas of how it would look, but I hit a time crunch, and finished it up on February 29th, just in time. The photos were taken by me in January. I really wanted to do a shoot in February, and I had a great idea, but could not execute it in time. I just thought it would be cool if the photos as well as the songs, were all produced in the month of February. There was only one song I recorded in Logic. I was hoping to do more, but again, time constraints prevented it. Not a huge deal I guess. Oh, as far as collaboration, I wanted to do more… I did get to work with Emma and Maddy a little bit, but no one else really. Next year, Milt and I might work together though. And drum sequencing is not easy! I have no problem playing guitar and bass, but I can’t really record my own drums easily with the recording equipment I have, and I have not found good, cheap, drum sequencing software yet. All of these songs are released under a Creative Commons Attribution License, which means you can use them in many ways without even asking me, as long as you credit me as the creator. If you need some other license, let me know. Posted on Wednesday, March 5th, 2008 at 12:45 am. Subscribe to the comments feed. Both comments and pings are currently closed. Post on your own blog. Pete, I’m proud of you! You stuck with this challenge, churning out an album in February. It seems you’ve learned great lessons for next time and for any potential clients who need album work done, so I think it’s a valuable experience for you. As for the work, I can imagine how much work this was. I’ve just completed 3 short podcast episodes and creating an intro song with GarageBand – it’s really hard work! I can’t imagine producing a high quality 10-song album and packaging in 29 days.